Click an image to view the chart in more detail. Click the caption below the image to read a description of the chart. 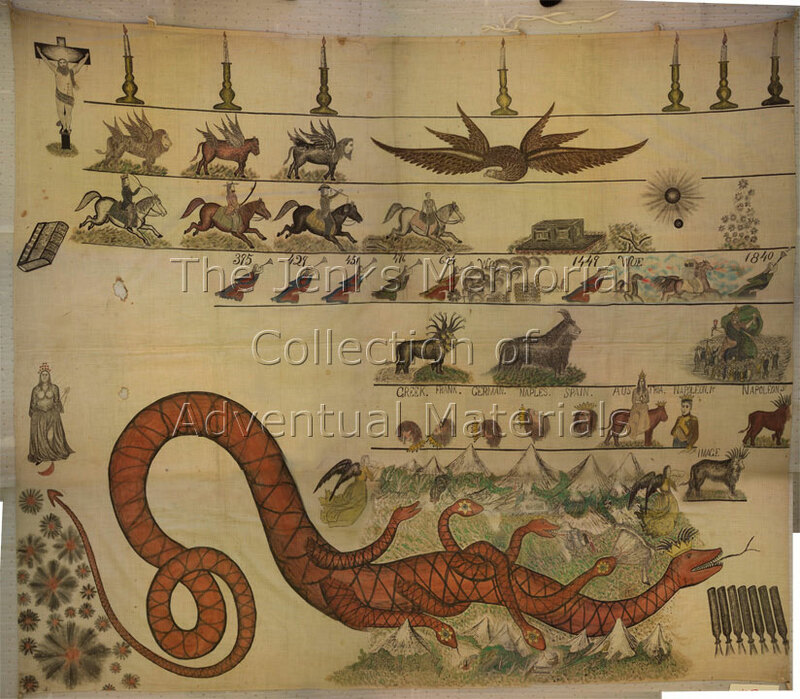 #1 A Chronological Chart of the Visions of Daniel & John [1843 Chart]. Boston: J. V. Himes, 14 Devonshire St.; B. W. Thayer & Co. Lithography, [1842?]. 4'7.2" x 3'2.2", color, hand tinted, framed. Well preserved. One of 300 lithographs printed. 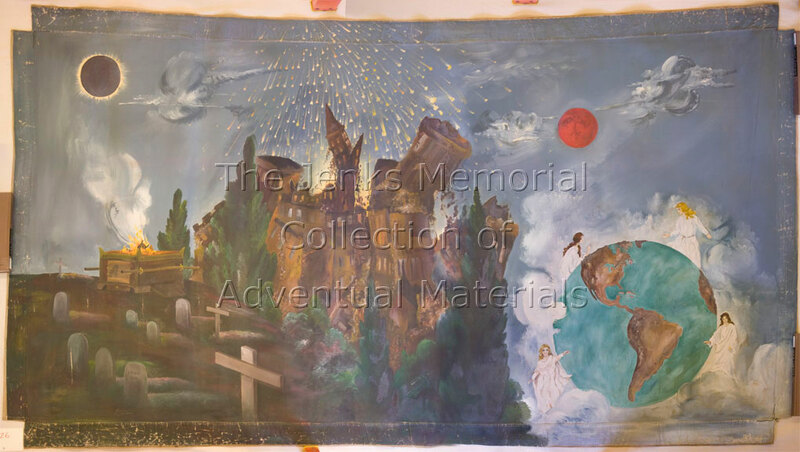 From larger original two-part canvas chart by Charles Fitch and Apollos Hale. #2 [1854 Chart: timeline to 1855]. Concord, N.H.: J. Cummings; Boston: S. W. Chandler & Co. Lith., #204 Wash N., 1853. 5' x 41", color. Well preserved. 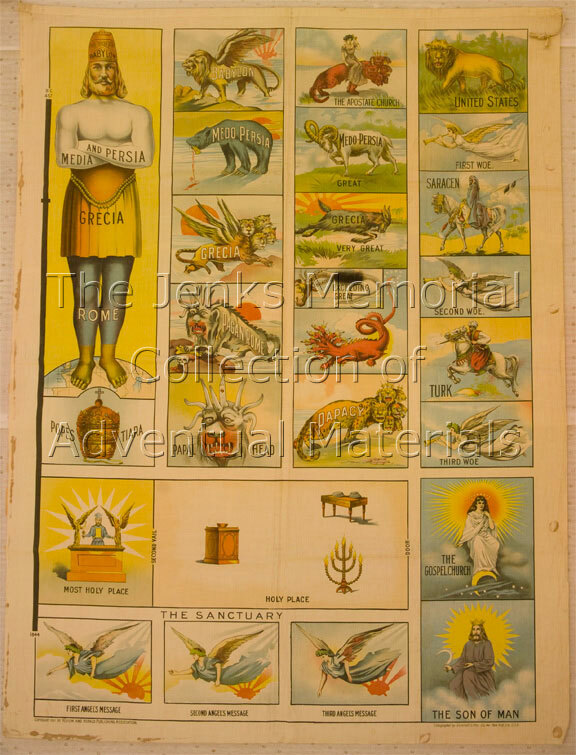 Symbolizes Daniel and Revelations, plus a map of the Roman Empire. Location: Pole #6 (Pre-Advent Christian). Accompanying materials: Cummings, J. Explanation of the Prophetic Chart and Application of the Truth. Concord: Reporter Office--Barton & Hadley, 1854. #3 White, James. 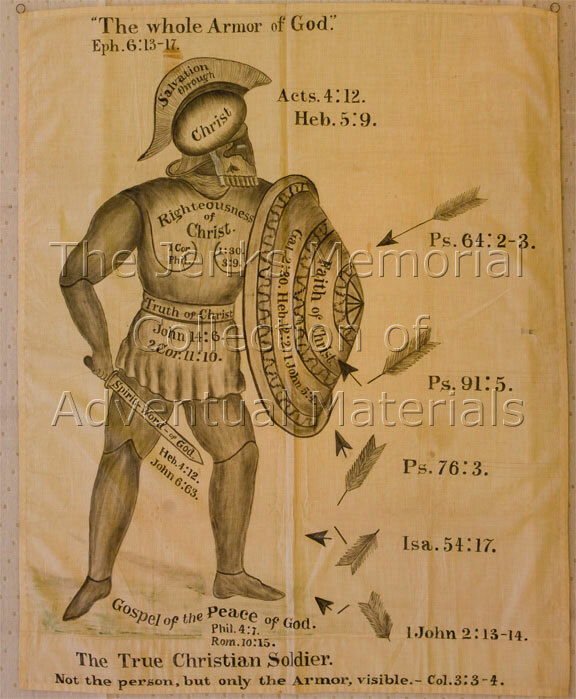 A Pictorial Illustration of the Vision of Daniel & John [SDA 1844 Chart]. Battlecreek, Michigan: Seventh Day Adventist Publishing Association; Boston: J.H. Bufford's Lith., [1863?]. 43" x 30.2", black and white. Adequately preserved. Initials "JY" in bottom right-hand corner. First published 1863. Emphasis on sanctuary/ holy of holies.  Provenance: Owned by David J. Maxwell of Modesto, CA, a charter member of the Modesto, CA, Advent Christian Church. Donated by Thomas C. Dilworth, Seattle, WA. #4 [SDA 1844 chart: timeline from BC 457 to 1844]. n.p. : Review & Herald Publishing Association; New York: Grinnel Litho Co., Inc., 1911. 3'9.2" x 2'10.2", color. Well preserved. Symbolizes Daniel and John with emphasis on sanctuary. #5 Locke, C.H. [Revelation]. n.p., n.d.
49'2" x 7'1", color, cloth with cloth loops and brass rings. Fairly good condition. 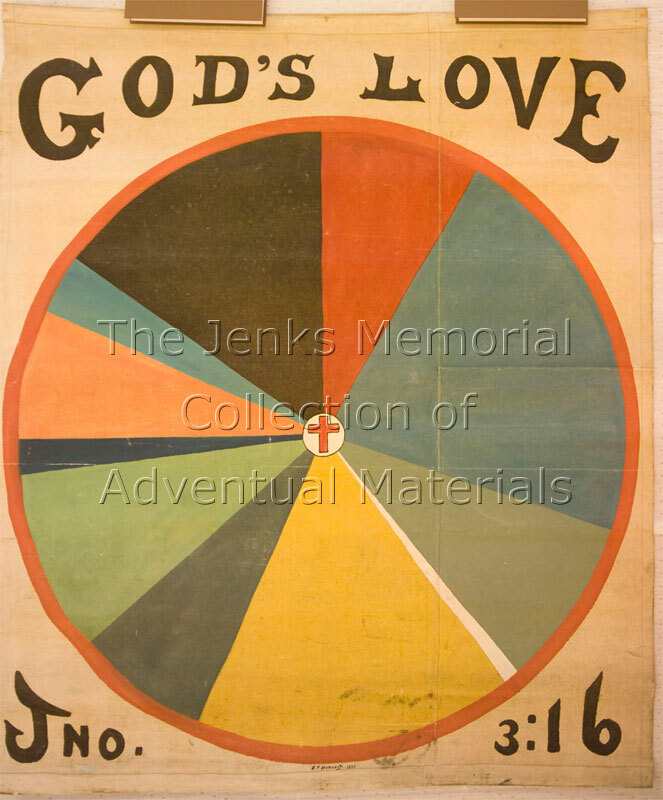 Probably the earlier of two similar charts designed and painted by C.H. Locke of Lake Village, NH. (Lake Winnipesaukee is not on this chart.) See also Chart #6. Provenance: Chart belonged to Dr. Alvin E. Lobb and was donated by his family. #6 Locke, C.H. [Revelation]. 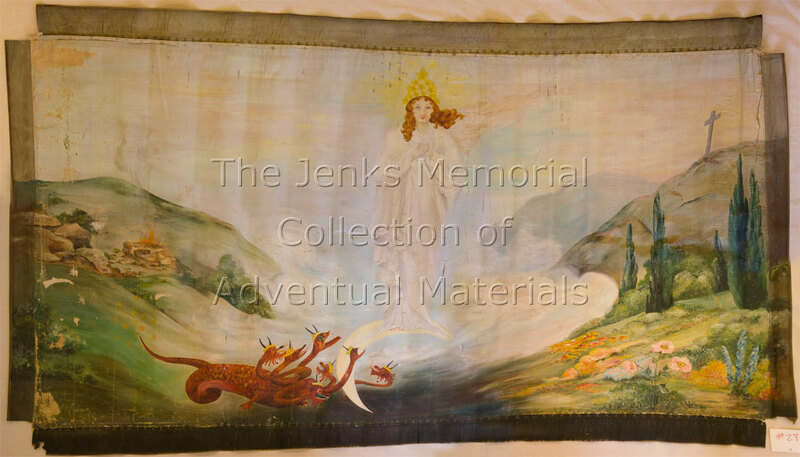 n.p., n.d.
38'2" x 7'1.2", color, cloth with rope reinforcing top edge. Fairly good condition. Probably the later of two similar charts designed and painted by C.H. Locke of Lake Village, NH. (Portrayal of heaven is a portion of Lake Winnipesaukee.) See also Chart #5. #7 The Whole Armor of God or The True Christian Soldier. n.p., n.d.
38" x 30.2", black and white. Good condition; one small hole right center. #8 [Multi-headed Serpent]. n.p., n.d.
6'2" x 5'3", color, loops on top edge. Well preserved; two small holes. 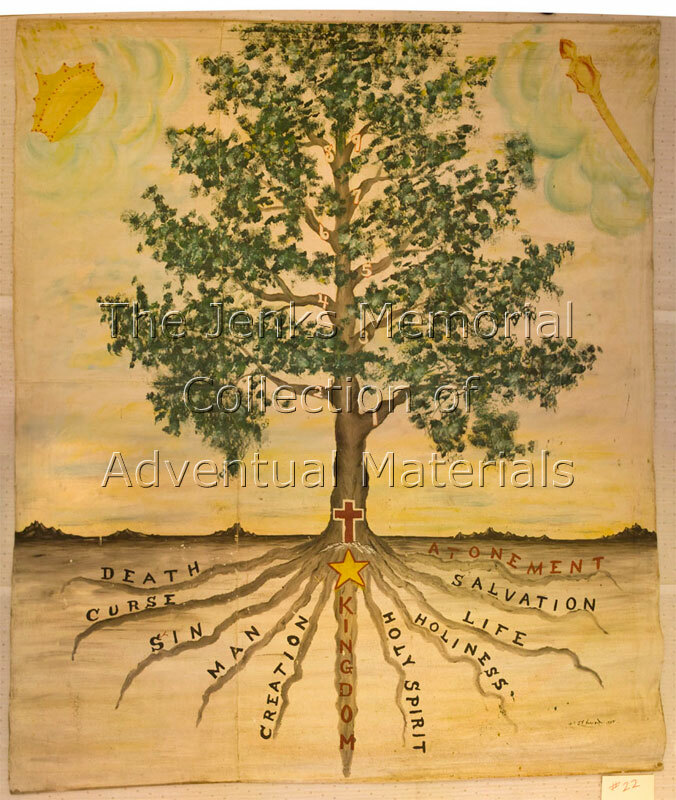 Symbolizes Revelation; includes timeline to 1840's. #9 [Seals Opened]. n.p., n.d.
6'8" x 35", color. Fragile condition. Depicts Revelation 4-8, including a timeline from the 1st seal (Caesar Augustus) through the 6th seal (star shower, 11/13/1833), to the 7th seal. #10 Bingham, George E. (1884-1957). [Genesis 2, Daniel, and Revelation]. Portland, Oregon, 1927. 11' 8.2" x 7'5", color, rings along top edge. Good condition. Scenes of Oregon depicting Garden of Eden and Paradise. #11 [Chronology of Israel and Persia]. n.p., n.d.
13'1.2" x 2'11", black and red, loops on top edge. Fragile condition. 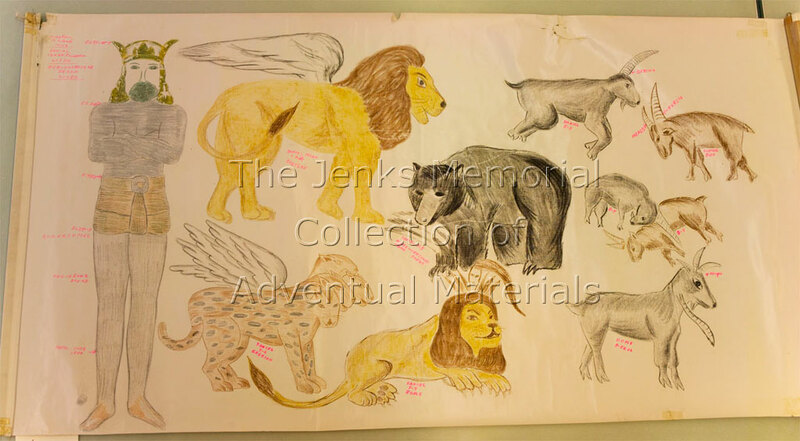 Provenance: From O. R. Jenks' personal collection. #12 Ogsbury, A. [Daniel]. 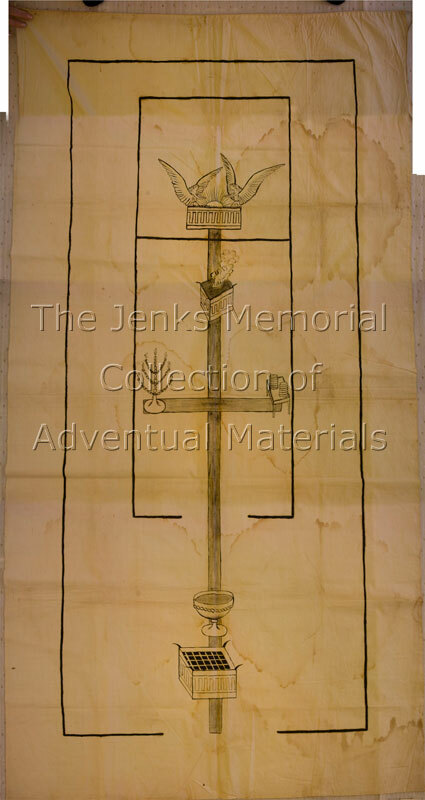 Normal, Illinois, n.d.
Provenance: Chart commissioned and used by Rev. A. P. Ferrell. #13 The Seven Asian Churches and The Seven Symbolic Trumpets. n.p., n.d.
10'2" x 4', color. Good condition. #14 Mahomedanism (partial). n.p., n.d.
14 3/4" x 15 1/4", color, framed. 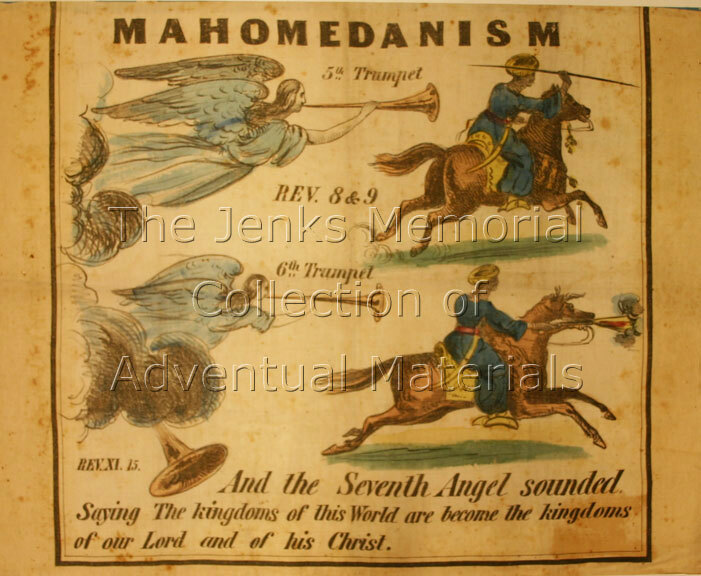 Portion of symbolic seven trumpets (5th - 7th) depicting Muhammadanism. Provenance: From effects of Elder William Sheldon. #15 Johnson, H.L. Prophecy. New Britain, Connecticut, n.d.
40" x 30.2", color. Painting is worn and fabric fragile. Planned & painted by H. L. Johnson. Symbolizes Daniel 2 with time-line ending in 1844 (fulfillments indicated). #16 Lawson, Josephine (1865-1963). Nebuchadnezzar's Dream: Daniel 2nd Chapter. n.p., n.d.
42 5/8" x 20 3/8", color. Well preserved. Created for Wm. J. Smith of San Diego, CA, in 1917. #17 [Elongated cross]. n.p., n.d.
5'9 1/4" x 3', black and white. Average condition, stained. Arc of the Covenant at top, 7 candlesticks, unleavened bread, cup of wine. 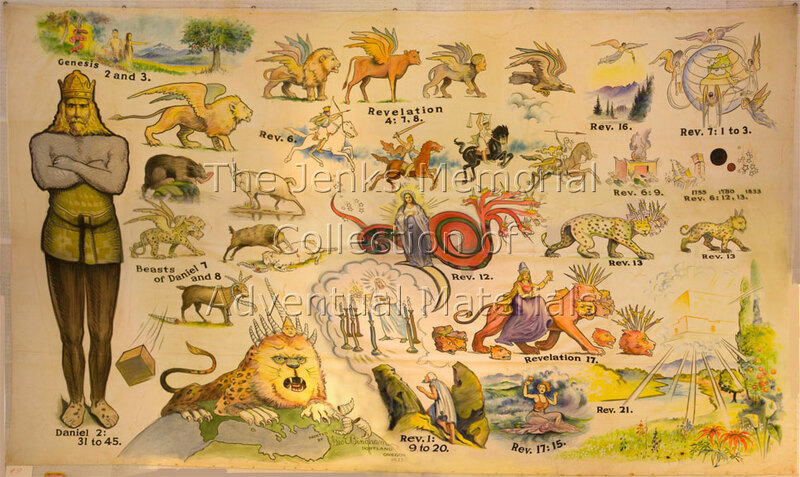 #18 [Daniel & Revelation with timeline 488 BC - 1915 AD]. n.p., n.d.
8'9" x 3'8", color. Good condition. Latest dates are penciled in. #19 Wentworth, Jesse. 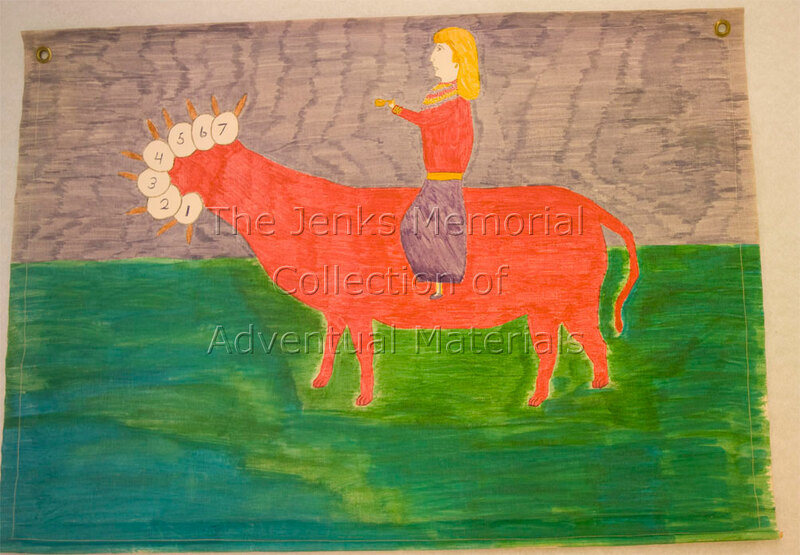 [Seven-horned Beast Ridden by Woman]. n.p., n.d.
33'2" x 24 1/2", color, canvas. Good condition. Jesse Wentworth was a lay minister in Massachusetts. Provenance: Donated by the artist's wife. #20 Wentworth, Jesse. [Daniel]. n.p., n.d.
5'11" x 3', color, on window shade. Good condition. Jesse Wentworth was a lay minister in Massachusetts. #21 Carter, H. E. [Genesis 2, Daniel, and Revelation]. California, 1905-[1920?]. 18'2" x 7'11", color, on cloth treated with beeswax and consequently very stiff, rings on top edge. Fair condition. Painted in 1905 with a few changes made later. See Carter letter, 12/16/41. #22 Hurlbutt, Jesse F. (1893-1980). God's Love. n.p., n.d.
63 1/2" x 54", color. Good condition. Side one: [John 3:16]. Side two: [Tree of Life]. Provenance: Chart belonged to Rev. A. P. Ferrell and came to the collection from the Ohio A. C. Conference. #23 Black, Henrietta (1900-1971), and Hurlbutt, J. F. [Black/Hurlbutt Chart]. n.p., 1933-1939. 10'6 3/4" x 5', color, oil on canvas. Good condition. Side one: Black, [Daniel 8], 1933. Side two: Hurlbutt, [Valley of Decision], 1939. #24 Black, Henrietta (1900-1971). [Daniel 2 and 7]. n.p., 1935. 10'8 3/4" x 4'11.2", color, oil on canvas. Good condition. Signed and dated. #25 Black, Henrietta (1900-1971). [Daniel 1-2]. n.p., 1935. 10'9.2" x 6'11.2", color. Good condition. A Son of Man, Christ knocking. Signed and dated. #26 Black, Henrietta (1900-1971). [Four Horsemen of the Apocalypse]. n.p., 1933. 4'9" x 12'2", color, oil and canvas. Very fragile; very poor condition. First horseman is a woman. God enthroned with lion, calf, human-headed beast, and eagle alongside. Signed and dated. #27 Black, Henrietta (1900-1971). [Revelation 6:12-20]. n.p., 1933. 5' x 9.2', color, oil on canvas. Good condition. Altar with slain of the Lord, city's destruction, four angels on Earth, and name on tombstone. Signed and dated. #28 Black, Henrietta (1900-1971). [Woman on the Moon]. n.p., 1932. 5'3" x 8'5", color, oil on canvas. Good condition. Signed and dated. #29 Black, Henrietta (1900-1971). [Revelation 19-21]. n.p., 1940. 5'6" x 10'11", color, oil on canvas. Good condition. Angel with trumpet, army of Heaven led by Word of God on white horses vs. armies of Earth led by kings on red horses. Beast and false prophet cast into lake of fire. Bride of Christ drawn in "Gibson Girl" style. Signed and dated. #30 Paine, Ph.D., J.A. A Chronological Chart of Ancient, Modern and Biblical History Synchronized by Hon. Sebastian C. Adams, with maps of the World's great empires. New York: Colby & Co. Publishers, 52 Broadway, n.d.
22'4" x 28", color, on cloth-backed paper, mounted on two rollers, prepared for hanging and display. Lithographed. Good condition, cracked at seams. Drawn by Prof. J. A. Paine, archaeologist of the first expedition of the Palestine Exploration Society. Fifth Edition - Twenty seventh thousand, critically revised and enlarged and brought down to A.D. 1883. Timeline from 4004 BC to 1900 AD. Fifty-nine centuries, depicting lines of Biblical patriarchs, nations, rulers, and political events synchronized. Provenance: A gift of Earnest T. Stephens, Aurora, IL, 4-1963. Accompanying materials: An accompanying wooden carrying case also holds John E. Colby's Key to Adams Synchronological Chart, 1880, 133 pp., 5th ed. brought down to 1883 (Latest date 1883). 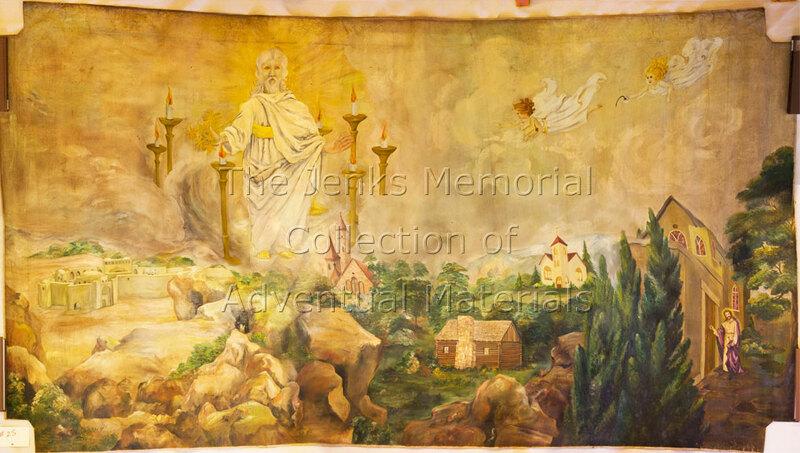 Location: Hewitt Secretary, Jenks Collection. 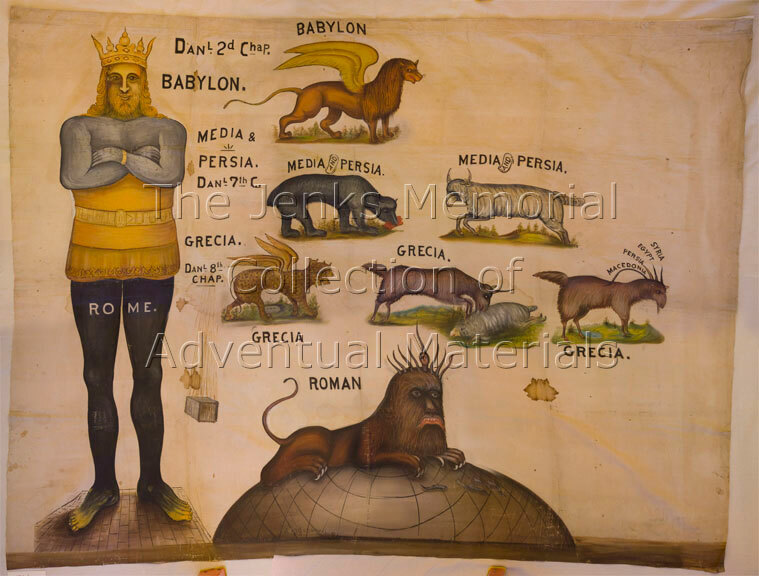 #31 Burnham, G. W. An Illustration of the Great Metallic Image seen in a Dream by Nebuchadnezar King of Babylon; with an Historical Diagram of the Four Great Monarchies of the World Chronologicaly Applied According to the Interpretation of the Prophet Daniel. Boston: A. C. Publication Society, 144 Hanover St., 1881. 30" x 11", black and white with some color, paper, three copies. Fair condition. Arranged and drawn by G. W. Burnham. Location: Large archival box, Jenks Collection. #32 [Burnham, G. W.(?)]. [World History]. n.p., n.d.
20'9" x 6'1 1/2", color. Good condition. Chart is unsigned, but probably by G. W. Burnham. Depicts world history from Adam & Eve to Christ's return and paradise, with special emphasis on Daniel and Revelation. #33 Burnham, G. W. [Map]. n.p., n.d.
14'6" x 6'8", color. Good condition. Left side shows the Americas and the Pacific Ocean. Right side shows New England. 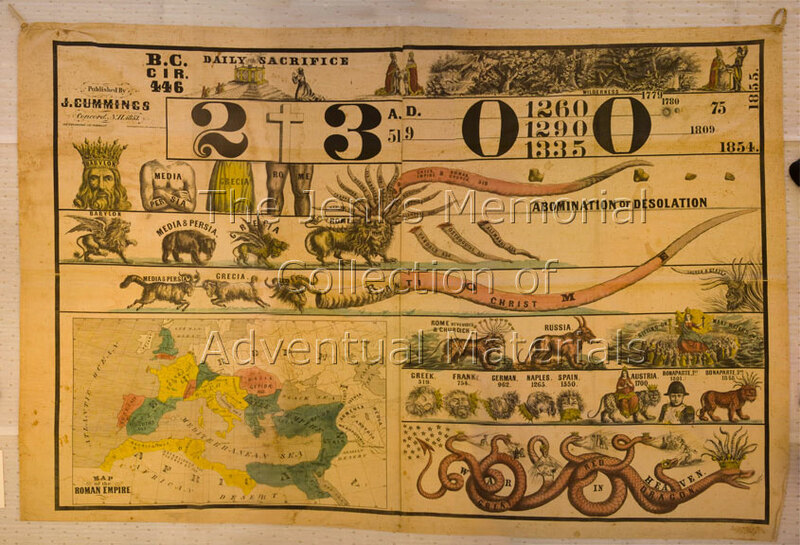 #34 Adams, Sebastian C. A Chronological Chart of Ancient, Modern and Biblical History synchronized by Sebastian C. Adams, Salem OR. Cincinnati, Ohio: Strobridge & Co. Lith., 1871. Entered according to act of Congress, in the year A. D. 1871, by S. C. Adams, proprietor, in the office of the Librarian of Congress, at Washington, D. C.
21'7" x 27 1/2", color, mounted on two rollers. Fair condition. Earlier edition of Chart #30, but no accompanying box or other materials. 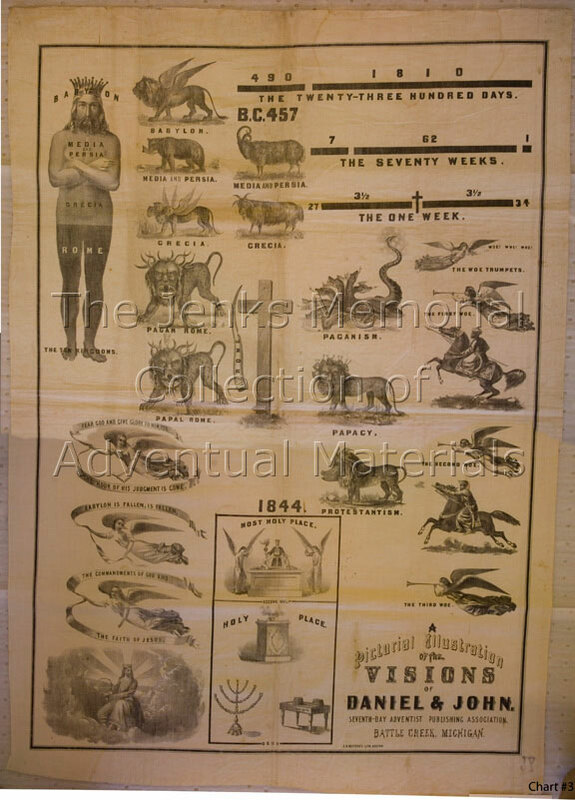 #35 Clouser, G. B. M. Dispensational and Prophetic Chart by G. B. M. C. 1892. 9 1/2" x 30 1/2", color, framed. Some water staining, missing lower right corner. Provenance: Donated by Edward Mermondo, Bensalem, PA.
#36 Honline, M.A. A Chart of the Old Testament and Contemporaneous History. 1904. 8'2 1/2" x 17", color, paper mounted on woven fabric, grommets on ends to hang. Good condition. Entered according to Act of Congress in the year 1904, by M.A. Honline, in the office of the Librarian of Congress at Washington. #37 Black, Henrietta (1900-1971). ). [Revelation 15:1]. n.p., 1940. 5' 4”x 11’2”, color, oil on canvas. Good condition. Seven Angels with seven plagues and World War II bombers. Signed and dated. 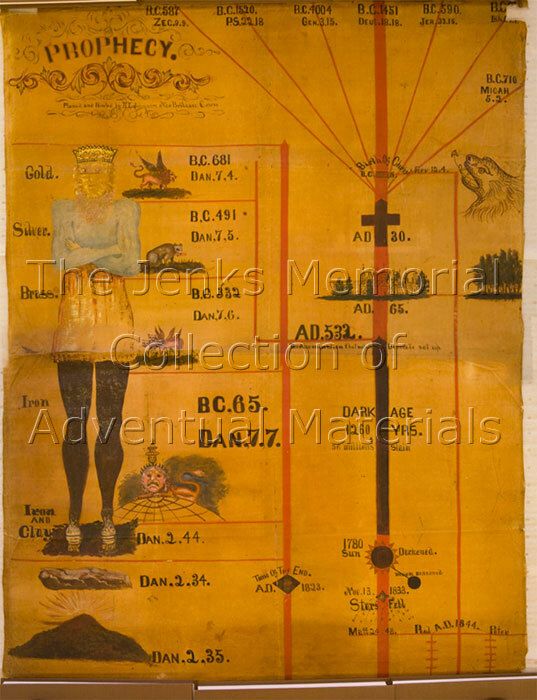 Charts #22-29 COMMISSIONED BY A. P. Ferrell and in his possession at time of death in Columbus, Ohio. Charts came into possession of Ohio A. C. Conference.